Buster Clegg, founder and president of the Rhode Island Reds Heritage Society, was still relatively new as the team's publicity director in 1962 when the team owner, Lou Pieri, directed him to begin work on creating a Reds Hall of Fame. Over the following weeks and months, Buster researched 36 years of Reds history and created a list of worthy candidates going back to the team's formation in 1926. Also assembled was a respected selection committee comprising mainly current and former members of the media who covered the team over the years and could provide first-hand familiarity with the play of each candidate. On the opening night of the 1963 season, with their portraits emblazoned on the game's program cover and full-length portraits displayed in the main Auditorium lobby, the 10 charter members of the newly created RI Reds Hall of Fame were enshrined. The final induction class was relatively short 10 years later. In all, 35 players, five pillar members, and eight longtime Auditorium employees fill out the Reds Hall of Fame. Of course, there were many more Reds who played only a short time with the team and went on to greatness elsewhere. We've assembled their profiles for you here, as well, the the Reds in Other Halls of Fame section. 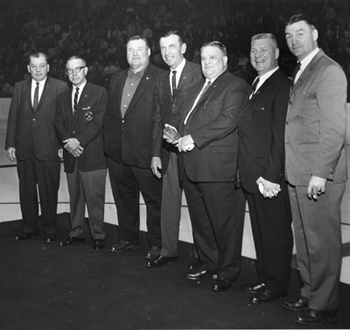 From left, Gizzy Hart, Johnny Gagnon, Art Lesieur, Mike Karakas, Louis A.R. 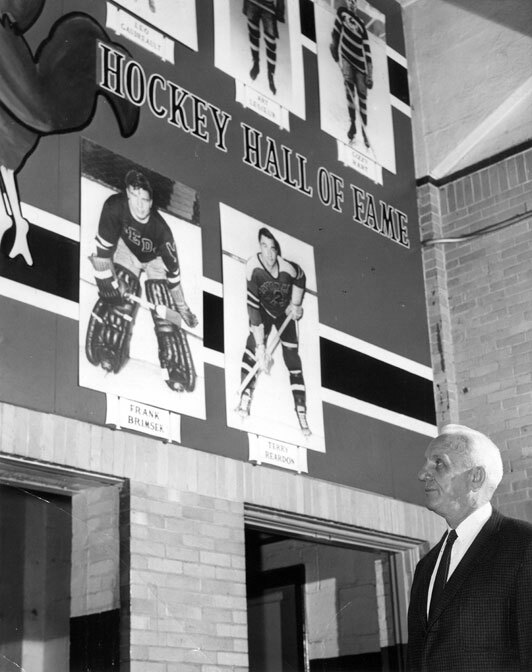 Pieri, Carl Liscombe and Terry Reardon at the 1963 induction ceremony. in the old Rhode Island Auditorium.